We have a very full calendar in the month of May with quite a number of classes and workshops going on. One of our classes was Yoga in the Garden, while our garden is in town and you can hear the traffic noises in the background it still provides an ideal setting for meditation, relaxation and learning. The garden feels cloistered behind the shop and tearoom and the pleasant chirping of the birds and the lovely fragrances of the herbs and the beauty of the flowers enhance the experience. 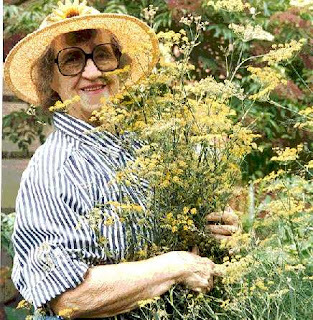 Our instructor Betsy May taught us how to salute the sun, twist like ivy and open like lilies to enrich our gardening experiences and to release tension in the body caused by gardening. It was a great class for all ages. Today is my Mother's Best Friend's birthday and this past weekend our families gathered at her daughter's home and celebrated this joyous occasion. It was a festive celebration, complete with a cake full of roses. My Mother and Missy K. first met in New Jersey in the 1950's. They developed their friendship over coffee, thru Garden Club, and during the school years, even coordinating memorable family vacations at a beach house in New Jersey. They maintained this friendship over the years and across the miles as we eventually moved to PA when my father was transferred here, and they later moved to DC. There were many road trips between households. Long distance phone bills were never questioned by husbands, merely accepted. Although separated by many miles, our families have grown up together, her children have married and now have their own families, and yet we still gather as if the years have stood still. I wish you a very Happy Birthday Missy K! You were such an important part of my Mother's life, and for that, I know my sisters and I are all grateful as you have graced our lives with many blessings and taught us the value of true friendship. Remember the good old days, when your imagination could take you anywhere? Do something fun today, hop on your horse or unicorn, don your pink hat, and ride around town, carefree! It's good for the soul. Remembering the brave service men and women that have valiantly fought for our country so that we may enjoy the freedoms we have today. Thank you. 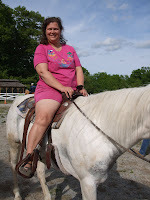 In anticipation of our Wagon Train vacation in North Dakota, we spent this past Friday evening getting used to riding a horse. 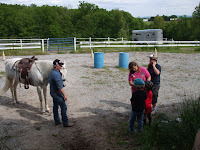 We had an intensive training session at a local horse farm which included instruction on tacking up, mounting, riding, guiding, grooming, and cleaning the hooves. The instruction included a lot of information and encouragement. It was a pleasant evening, including a picnic in their gazebo while the kids chased the farm kittens. In addition to the opportunity to ride in the wagon train, or walk alongside, there will be 2 horses that will be our responsibility. Between the 11 of us, (family and friends) there won't be a lot of time on the horses, but just enough to provide additional enjoyment for our vacation. 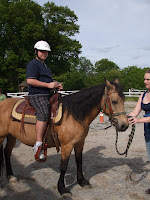 We have often been on trail rides, but this adventure will require a bit more responsibility on our part. For additional information regarding our wagon train adventure, visit Fort Seward Wagon Train. We leave for two weeks in June and July. Be prepared for additional stories and photos upon our return. This will be a unique vacation which involves camping and assigned chores. We're also required to dress in Prairie clothing, unless riding the horses, then blue jeans are acceptable. And multiple lessons for all in attendance. And stories, I'm sure there will be stories to tell; with photos. As part of our ongoing 40th Anniversary celebration for The Rosemary House, we featured a Garden Party this past weekend. Sandwiched between two rainy dreary days was a perfectly delightful Saturday, providing a respite from the rains, lush gardens, and a wonderful gathering of family and friends; complete with a champagne toast at noon. 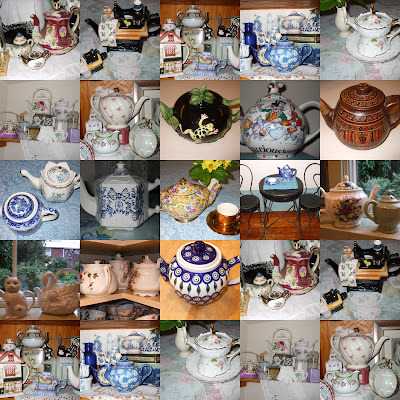 Enjoy this sampling of teapots that can be found throughout the house. What fun it is to collect these treasures and to be able to display them also! Thanks to Gracious Hospitality for hosting this tea themed blog-a-thon. It has been fun participating in the weekly themes. The Wedding Gift - Happy Anniversary! Today marks our parents Wedding Anniversary - May 19, 1945. Before my Mother passed away, they celebrated 54 years together! My Mother would refer to my Father as 'The King', 'Friend Husband', and even 'Supperman' as once he retired, he started preparing their evening meals, using herbs of course! This lovely luster tea pot with matching creamer and sugar bowl was a wedding gift presented to my Mother and Father in 1945 by her brother Harold. The markings on the bottom say Eggshell, nautilus, U.S.A. It has graced our family home for well over 50 years, but when it came time to leave the old homestead, my father gifted this set to me which I now proudly display in the china cupboard in the tea room. It is a treasure, a definite family heirloom, and one I am proud to own. It takes center stage, subtly reminding me of the strong foundation of their love that has nurtured not only our family and extended families, but the friendships that have developed and the businesses that have been established and grown with love and hard work. As part of the Gracious Hospitality Blog-a-Thon this week, we are to share our Favorite Teapot and its story. This one was meant to be shared today, on their Anniversary, and conveniently it ties in with this weeks theme. Combine chopped eggs, curry, lavender blossoms and mayonnaise until well mixed. Add enough mayonnaise as you prefer, for spreading ease. Let flavors blend overnight. Spread mixture onto slices of white bread. Remove crusts, and cut into triangles, or any other shape. Cover until serving. In loving memory of Bertha Peplau Reppert, forever in our hearts. Looking for something quick and refreshing to serve, and full of fresh flavor? Try Minted Pineapple. Peel, core, slice, and cube a fresh pineapple. (Canned will work, but using fresh is recommended.) Snip fresh mint, spearmint or peppermint will do, until fine. Toss the pineapple, the fresh mint, and 1/4 c. orange juice in a bowl. Allow flavors to blend for an hour or so. Serve at room temperature. This is a delightful accompaniment to a lunch or dinner menu. Our front tree is loaded with flowers and the perfectly heart shaped leaves are starting to pop out. This Eastern Redbud tree, Cercis canadensis, is native to northern Florida up to parts of Canada. The flowers are edible and are deliciously sweet and peppery. We nibble on them by the handfuls. Considered an understory tree and approved as a street tree in our town it typically reaches only 20 feet in height. This hybrid variety features reddish leaves. Usually the leaves are green, and by the end of the summer the red leaves will have turned to green, but they are always a perfect heart shape. I have heard this tree called Spicewood, because sometimes twigs of this tree are used to season venison. Were I to be "Queen of the May" this is definitely where I would hold court. These charming castles are located in the gardens of Vermont herbalist Rosemary Gladstar. They were handcrafted by Uncle Eddie, a clever and creative New England artist. This little section of our raised garden beds features little shoes and some big shoes too, that have been planted with a variety of hens and chicks. The emperor Charlemagne once decreed these little succulent plants should be planted on thatched roofs to aid in prevention of fires. The baby shoes are at least 4 years old to 7 or 11 years old. The once bright red fire boots were Cedar's classic foot ware for quite a number of years. We had a continual supply of boots. The tulips are in bloom and that is a favorite cradle for the baby fairies to rest in the evening. The gentle swaying of the tulips keeps the babes asleep while the mom's and dad's dance the night away. This charming perennial pops up in early May every year. Such a beautiful plant with a sad name. There are many stories that surround Dicendra, including many of Princess Dicendra which you can often find dancing in the flowers. Many stories include Princess Dicendra being lost in the woods and thus having her heart broken and bleeding. When I was a girl my mother taught me how to take apart the flower and find the pink Tunic, the beautiful earrings, the dancing slippers and of course the wine bottle. Happy May Day to You! 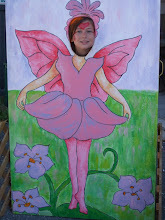 We are happy to share some photos of our fairy garden today. The first is a fairy habitat that the Faeries created using shells, twigs, cinnamon sticks, beads and other found objects. This is our fairy garden, home to many fairies and fairy treasures. There are many mossy areas and the ferns provide an ideal privacy screen for the fae. Every nook and cranny holds a treasure. Are there fairies in the bottom of your garden?